Last week felt like such a blur and I don’t even know why! Maybe because I started the week working with my pal Dina all day which was a slightly different workday routine. Or maybe it’s because the week started out at 5 degrees with snow and ice on the ground and then jumped up drastically to almost 60 degrees by Thursday. I went from barely being able to walk out the front door in fear of frost bite or falling on my face to taking afternoon walks just to feel the fresh warm air. 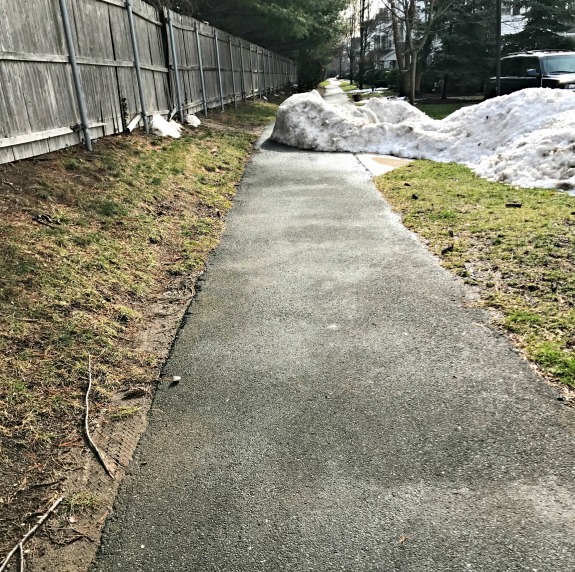 Just a minor snow block on my running path which quickly melted by the weekend! Running was totally up and down last week, that’s for sure. My mind keeps going back to the idea of taking a Soul Cycle spin class one of these days real soon so I think I will do just that. 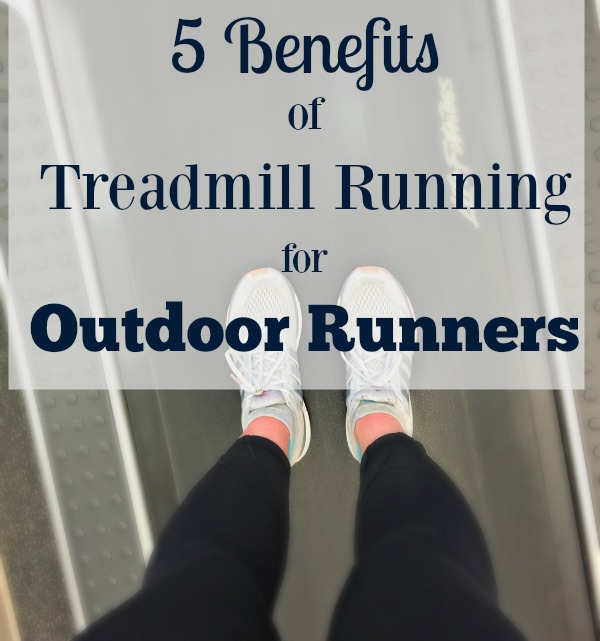 Speaking of running, last week saw a HUGE spike in views for my post, 5 Benefits of Treadmill Running for Outdoor Runners. I think Pinterest had something to do with it. In case you missed this post last year, here’s the link! My life is best recapped in food. Without going in any particular order…. This thin crust pizza was just everything to me the other night. EVERYTHING. 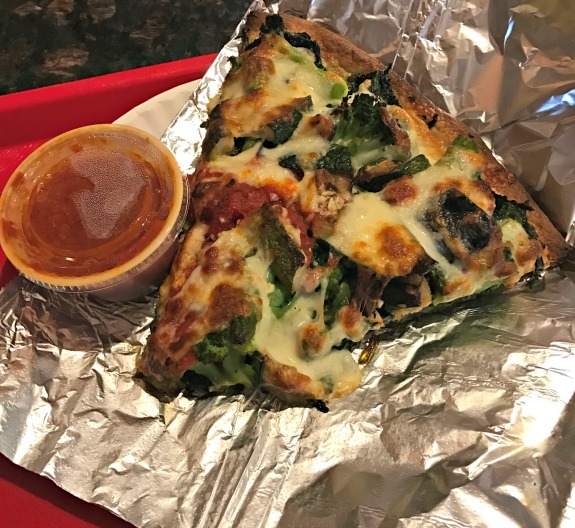 I must be on a pizza kick because I had my favorite whole wheat veggie pizza Friday night before my son’s outdoor hockey game. He had two games this weekend and three games coming up next weekend. Good thing I like hockey. We were due for salads from Chopt last week. This time we took our salads home with us rather than eating at Chopt because my son didn’t like how his hair looked enough to be possibly be seen by someone he knows from school. I agreed to leave because I remember what it’s like to be a kid. 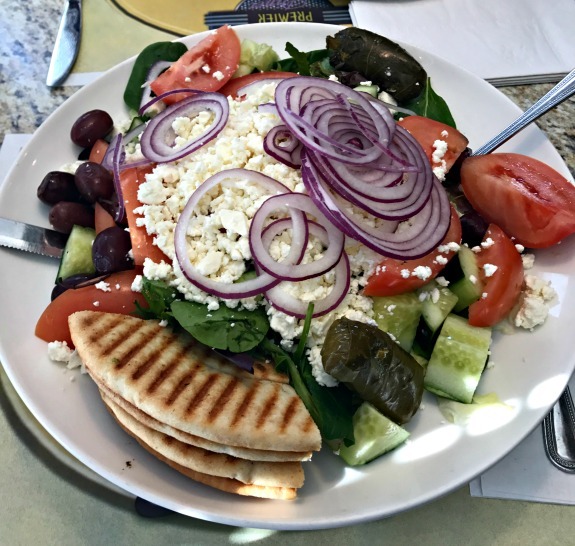 I had this greek salad at lunch with a friend yesterday at The Premier Diner. Sometimes I really love a giant salad! So this is major. Sit down for this one. The Cheesecake Factory changed Linda’s Fudge Cake. Without telling me. They just brought me a slice and left it up to me to realize it is different! In fairness, it still tastes amazing but why change an already good thing?! Why now serve Linda’s Fudge Cake with less whipped cream, less chocolate chips and why MAKE IT SMALLER?! Linda’s fudge cake now appears on the plate upright like a slice of cheesecake rather than on its side. Maybe this is done in an effort to trick me into not noticing there are less chocolate chips. The chocolate fudge icing seems a little different too yet I think tastes the same if that makes sense. I do not like change especially when the change involves my favorite desserts. Can’t we just leave well enough alone? Linking up with Meg’s Week in Revew! Who is off from work/school today? How do you feel about change? Do you roll with it or freak out? Last week was definitely a strange one! I am still figuring out Pinterest but its definitely interesting how certain posts will all of a sudden become really popular. We got pizza delivered from our favorite place (best pizza in Baltimore but still not as good as NY) on Saturday because there was ice and freezing rain. Sometimes I will go months without eating pizza and then sometimes I end up eating it twice in the same week. You’re right–I can definitely tell that there are way less chocolate chips. What were they thinking? I’m curious to know why they’d change it! I remember when I was a teenager, I’d get really bad zits and once in a while my mom would let me stay home from school so I could put antibiotic cream on it and let it air dry. Ha ha! I guess I’d do the same for my teenagers too. Why mess with chocolate cake perfection? I would not be happy about this recent adjustment either, especially since it’s a favorite. 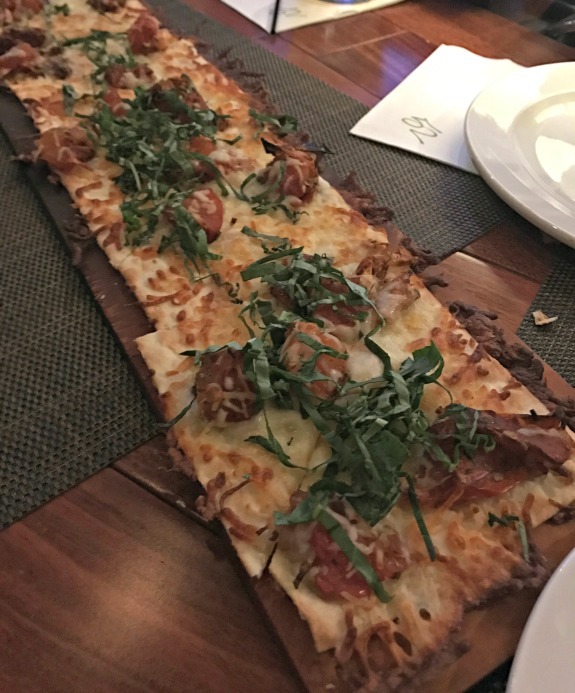 I adore pizza of all kinds, although think crust has a special place in my heart. Then it’s all about those toppings. 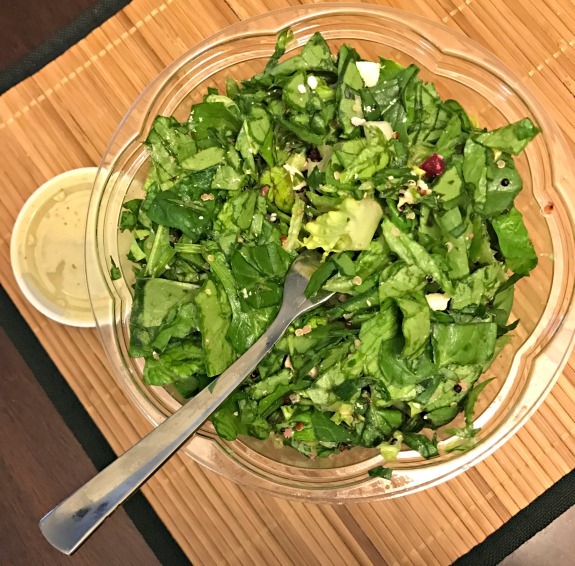 I’ve been on a salad bender too lately, although none looked quite as good as your diner salad. Um if I’m ever in NYC, I need to go there. Congrats on the traffic spike. I know it feels good to see an older post get some traction. That’s the WORST! My favorite restaurant in Atlanta changed the recipe for my FAVORITE dessert – flourless chocolate cake with a sprinkle of sea salt and a drizzle of olive oil. I nearly cried. Ughhh I would be so upset if my favorite dessert was changed. If it ain’t broke, don’t fix it!! Best thing I ate all weekend was everything at Borough Market! I was in London for a couple days and spent Saturday eating my way through the market. Such a cool place and tried so many fun, random things! Arthi recently posted…(Less Than) 48 Hours in London. All that pizza looks so good! I was in a pizza mood also this week and a BBQ chicken sourdough pizza was the best thing I ate this week. Not had Lindas Fudge cake since our last US trip but we’re planning to be over again soon and most America trips are based on going places within easy reach of a Cheesecake Factory. 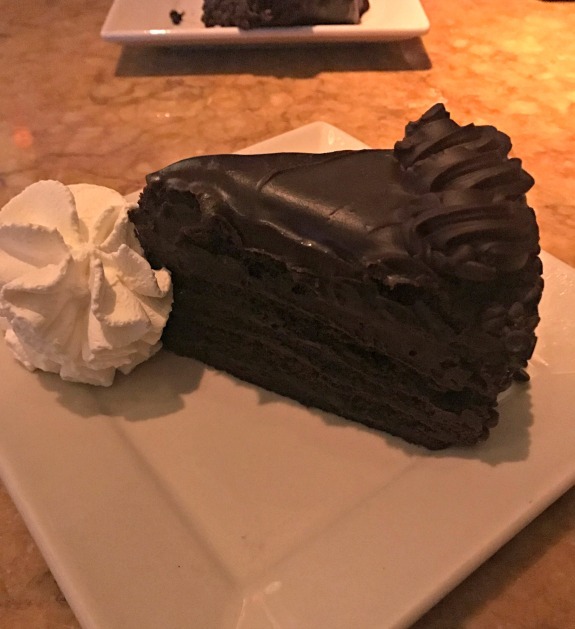 On all my trips to Denver, every night would entail having some fudge cake to finish the mean and ordering a couple of slices to take back to the hotel… for breakfast next day! as people said… Don’t mess with perfection! Sad times! I mean, the new cake is still really good, I just totally hate change!